Cascade Plus 16G is specifically formulated to increase both the rate and depth of water and nutrient infiltration on hydrophobic soils. 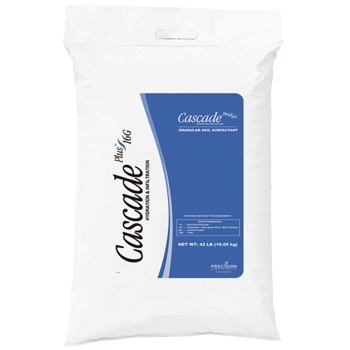 Cascade prevents or corrects Localized Dry Spot (LDS) conditions for 4 to 6 months with a single application, making it the first true residual water infiltration system that gives long-lasting color and quality improvement. It can be used on all turfgrass areas, including golf course greens, tees, fairways, athletic fields, lawns and sod farms. It can also be used on newly seeded turfgrass in order to reduce watering needs. Apply Cascade Plus 16G 3.5 - 7.0 pounds per 1,000 sq. ft. Each 42 pound bag treats approximately 5,700 sq. ft. at the 7 pound rate.